Free lead sheets are an excellent way to not only stretch your music budget and your students' repertoire, but also to stretch their musical skills. Lead sheets require an understanding of chords! What's so useful about a lead sheet? A lovely Scottish poem and song which works well with guitar or piano. Using their understanding of chords and chording patterns, music students will learn how to take a simple melody and make their own arrangement. 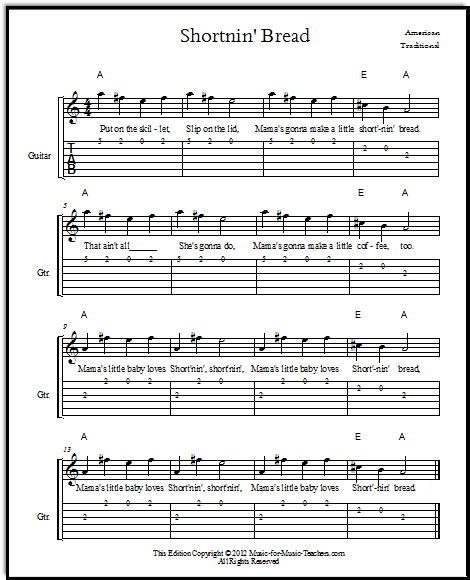 A pretty lullaby, useful for learning different kinds of strums and chord patterns, piano and guitar. Chord practice! And chord relationships! An unusual Christmas carol, set in a minor key. Piano students in particular may start with very simple melodies and chords. Eventually, they will be able to employ flowing or powerfully rhythmic left hand parts, and add harmony in the right hand. 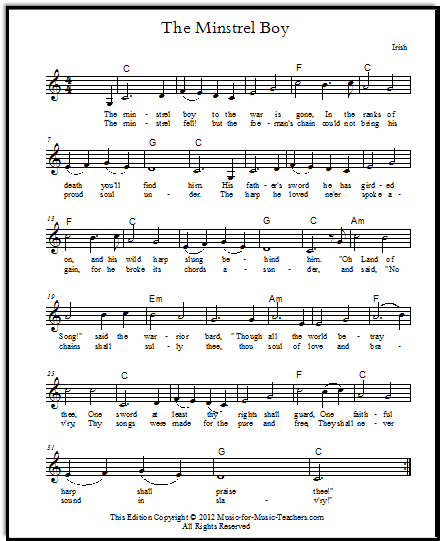 The wonderful song with words by a former slave trader, turned repentant. So... what IS a lead sheet? Whether for guitar or piano, music lead sheets are simply the melody of a song, with chord symbols added above the notes. "My country, 'tis of thee, sweet land of liberty, of thee I sing." With melody in bass clef, treble clef, guitar tablature, and viola clef too. The right hand (of a piano player) plays the melody while the left hand plays a chord in the left hand. For a guitar player, usually the guitarist sings the melody and strums or picks the notes of the chord. "O beautiful for spacious skies" - this song is frequently used as a test for singing auditions, in high schools in the United States. Lead sheets are easier to read! And for some students, much less intimidating. An energetic song for the Navy! 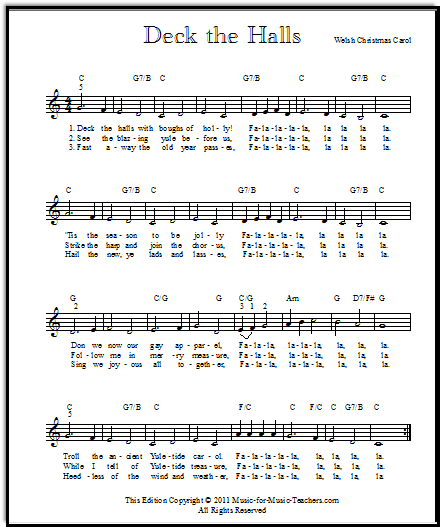 Check out all the free lead sheets (many of them will also be found on the Vocal, Piano, and Guitar pages) and you will see that the majority of them are just a few lines of melody in the treble staff. The lovely Christmas carol with the "Glo-o-o-o-ri-a!" section. Use lead sheets to make progressively harder arrangements. A great fiddle & guitar song. 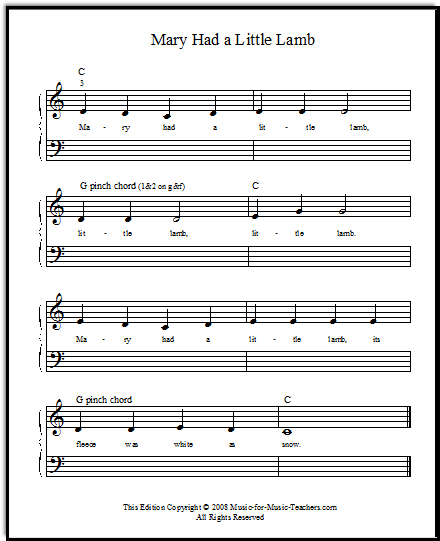 In the key of C (shown here) and also the key of G.
With a few of my free lead sheets, I have left a blank bass staff for piano players. 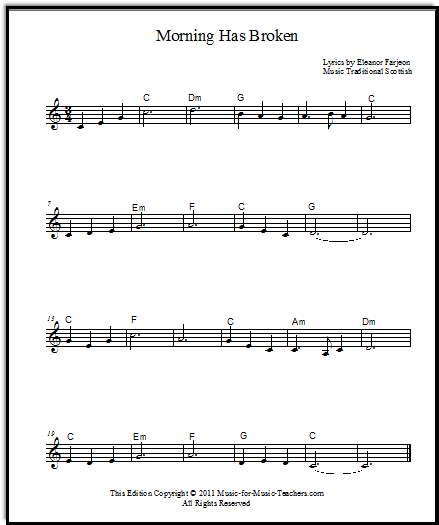 That way, sample chord patterns for the left hand can be written out in the empty measures, to give students ideas, or to jog their memory when they get home from their lesson. "Over hill, over dale, we will hit the dusty trail"! Some of the leads have guitar tabs for the melody as well. A pretty old-fashioned song from Wales - "Down yonder green valley..."
You will sometimes hear this song in movies about bygone days, such as "Pride and Prejudice." 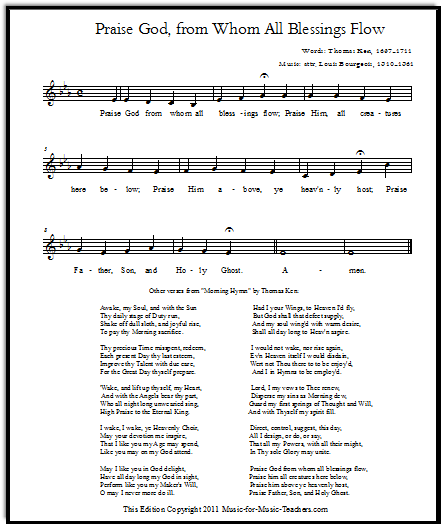 The tune is also used as a hymn melody: "Let All Things Now Living." Further down the page, see my performance suggestions if you need ideas for how to use my free lead sheets. Another pretty Christmas song, this one about Baby Jesus. Hello! First of all, I love your site! I wanted to ask you about lead sheets. I learned piano when I was young for few years, but only the classics. Now they're a bit difficult for me, and I want to play easier and more enjoyable pieces. I saw an infomercial before mentioning lead sheets, how it makes playing piano easier, and I want to ask you, how do I use it? I'm really bad at chords, does that mean I need to know all my chords before playing a lead sheet music? 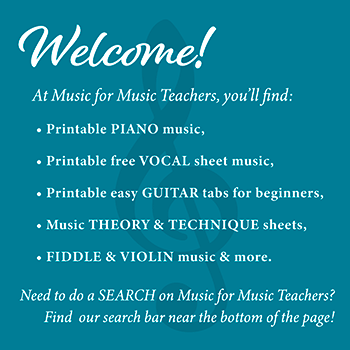 I have a page of links to lead sheets https://www.music-for-music-teachers.com/free-lead-sheets.html which has some instruction about using chords. Also, my piano pages "Mary Had a Little Lamb," and "Twinkle", and "Water is Wide" all have information about chord patterns and uses. Those are EASY BEGINNER pages, but very useful if you are unfamiliar with chords! Also, take a peek at https://www.music-for-music-teachers.com/printable-piano-chord-chart.html - this page is a graphic showing what the most common chords (major & minor chords) look like. This minor melody is unforgettable. Some of the words are risque, so I omitted them - sorry! This is a beginner arrangement for fiddle & guitar of this bluegrass favorite. Very easy, with lots of repetition. This is the song I use to get kids started flatpicking. Why use lead sheets in your studio? It's good to shake up your music lessons with activity changes! This is a great bluegrass tune you may never have heard before! Same as the Army Song, above! I suggest setting aside a portion of each music lesson for a rotation of activities, different every week. 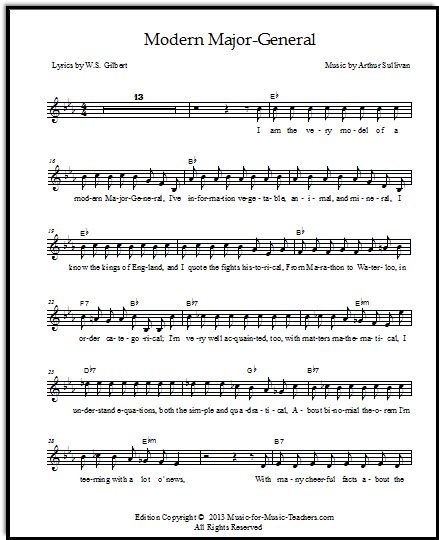 Along with games that stretch and reinforce understanding of music theory, give kids lead sheets (and if you can, free lead sheets such as I have here!). 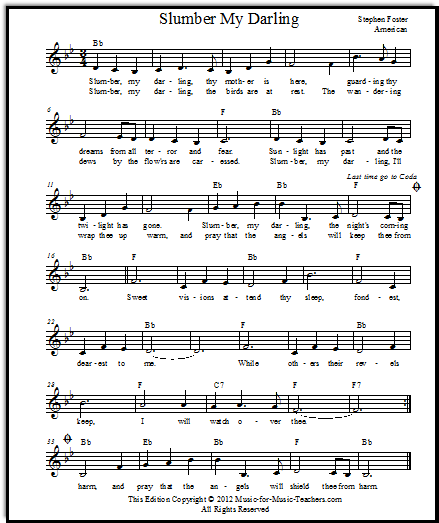 This fun song with silly lyrics can be simplified to just 5 notes. 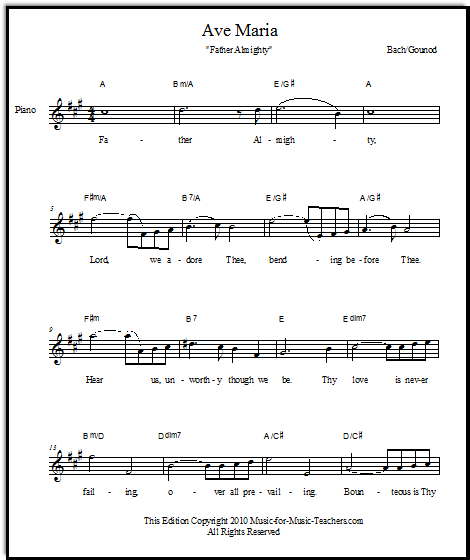 Starting very simply, students will gradually hone their arranging skills and feel "cut loose" from the written page. This is a sweet love song, with a surprisingly pretty melody. Especially for pianists, this is an entirely different way to make music, and will gradually lead to playing by ear (which I personally believe every adept musician ought to be able to do). 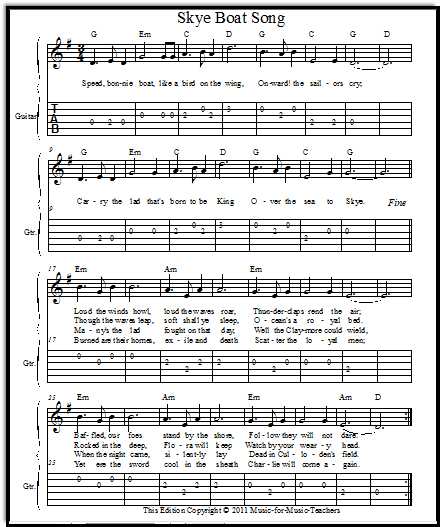 This an excellent melody with an old-fashioned American hymn sound. What KINDS of lead sheets? 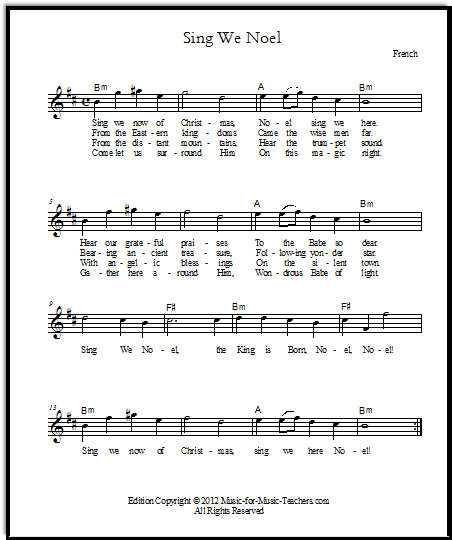 In addition to using older, public domain songs, one kind of lead sheet I've had a lot of success with among my students is contemporary Christian lead sheets such as "Be Unto Your Name," "Shout to the Lord," "Give Thanks," etc. I Will Arise and Go to Jesus, from Southern Harmony. 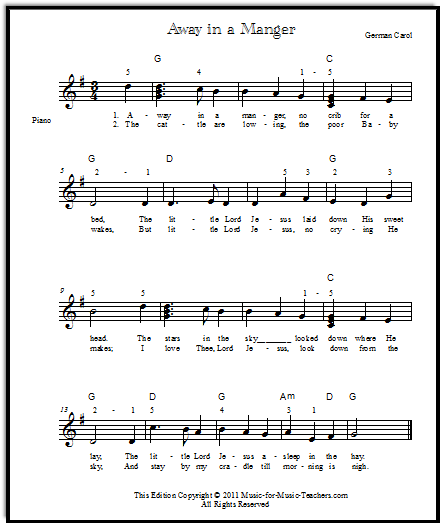 This hymn has the same words as the previous one, but a very different melody, minor and beautiful. But those ones aren't FREE, are they? Of course, those ones are NOT free lead sheets, being under copyright. So I go looking for these songs on SheetMusicPlus.com (they have digital downloads now) or Musicnotes.com. A very popular Christmas carol that kids love to play! After buying the version I like, I loan students page 1, with instructions to give the music back to me and buy their own copy if they want the whole thing. A beautiful but CHALLENGING vocal round. The words mean "Give us peace." A sweet old song from the mountains of Appalachia. A still-popular song about driving a mule and a barge along the Erie Canal. A truly lovely hymn I never tire of, about looking beyond the troubles of today to the "field of endless day." A goofy song for a "certain age bracket" that uses only 2 chords! This melody progresses in easy steps downward, after the initial octave leap. A song that praises God and calls upon him, in a simple tune. A fun song about soldiers and eating peanuts that comes from Civil War times. Though kids may initially be reluctant to try this unfamiliar song, it quickly becomes a favorite! One of the loveliest and oldest of melodies. Originally, the words were addressed to a Lady Greensleeves. Later, the meaningful lyrics "What Child is This" were attached to this melody. From England comes this unforgettable song about impossible love. The one shown to the right may seem impossibly high for the average singer, but fear not, I have the lead sheet in many keys, from A to Z! Just kidding. From A to G.
A good beginning round for singers, with words sung by a "hobo"
An opera song about a girl who dreams she is not really a gypsy, but a princess. With the vocal line in several keys, or with the standard piano accompaniment, also in several keys. This is very easy, for an opera aria. A song about flying away joyfully to heaven when the day comes "when I die". 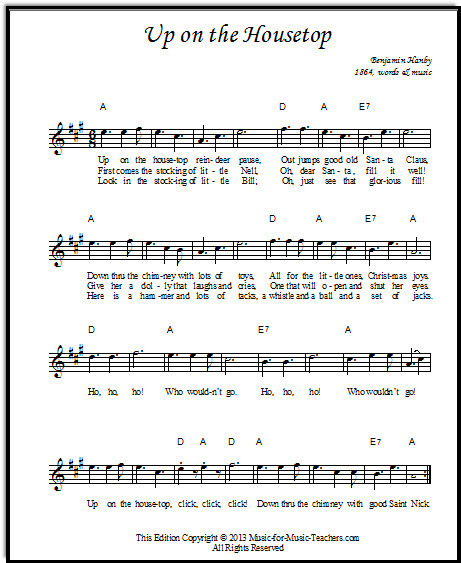 One of the Christmas songs everyone knows - and it only has 5 notes (in the chorus)! "Come by here, my Lord"
An old song that still seems fresh & sweet. Several versions, including a fancy piano accompaniment for vocalists. A brisk tune great for fiddle & guitar, from Scotland. Lyrics can be found on this page as well. A handy song for beginners! 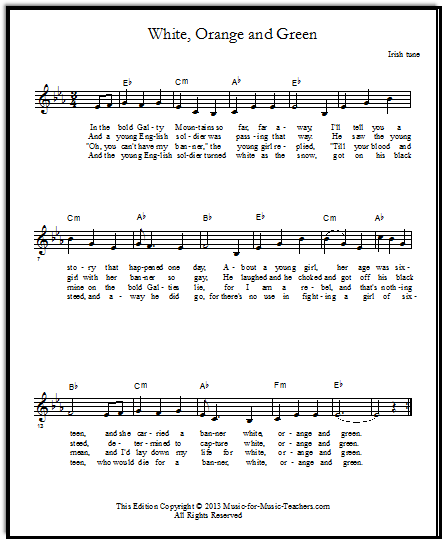 My students all master this song in order to learn to use chords well! 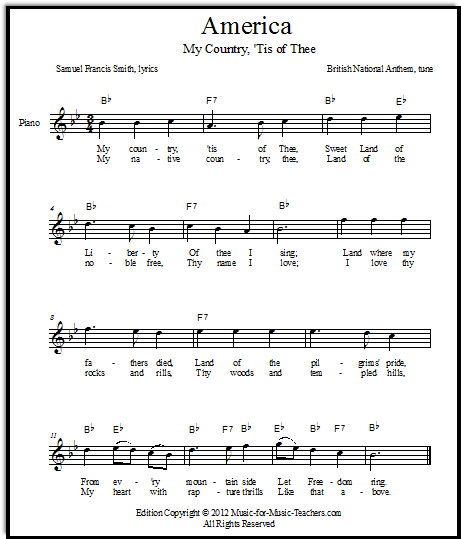 - another sad but lovely patriotic song about love for one's country - and a harp. 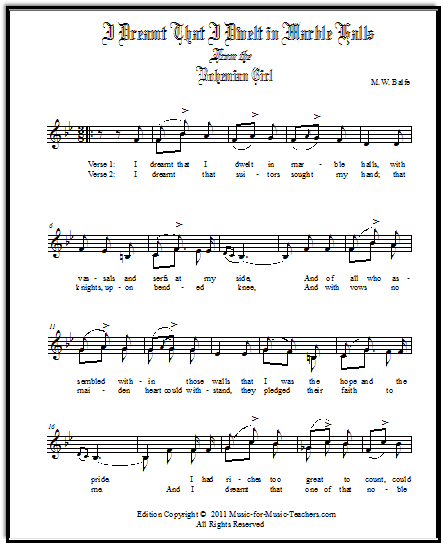 Often called a "patter song," this particular solo-with-optional chorus from Gilbert & Sullivan is a tongue-twister! For that reason, even students who initially balk at classical music and light opera will take pride in being able to sing this song FAST. Very beautiful chords in this song. This song is offered in numerous keys, and for different clefs. This is a famous and beloved Christmas song. A super-cute song that mostly moves step-wise. Very fun lyrics, and easy chords and tabs for beginning guitar. This is the song I sang as a kid that went "On Top of Spaghetti!" Also known as "The Little Beggarman". 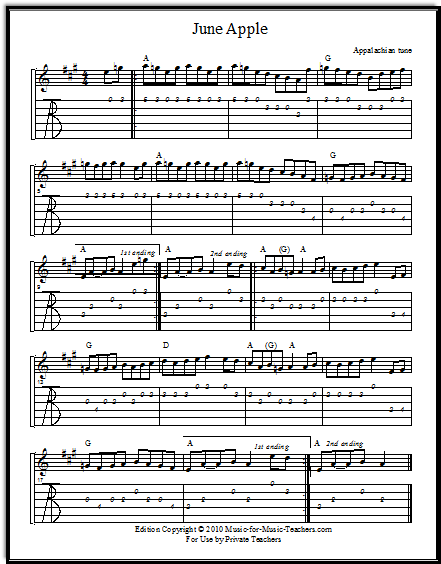 This is a very fun & popular flat-picking song for young guitarists! A swingy, energetic, pretty piece, especially nice for fiddle and other melody instruments. 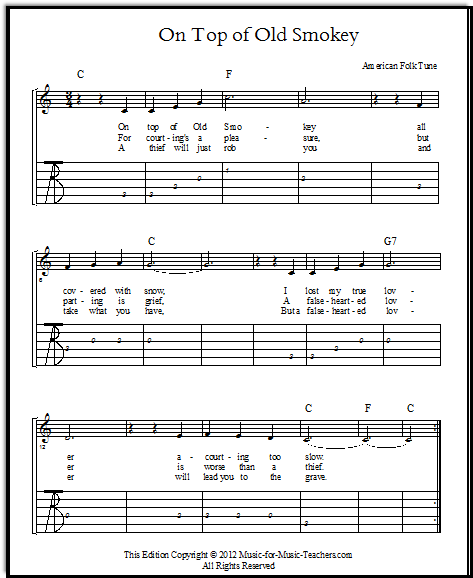 A couple different versions - one showing a finger-picking chord pattern with walking bass. Lead sheets in many keys. The most famous of the Scarborough Fair melodies. A love song? or a song about travelling "across the wide Missouri"? Either way, it is a lovely American song. 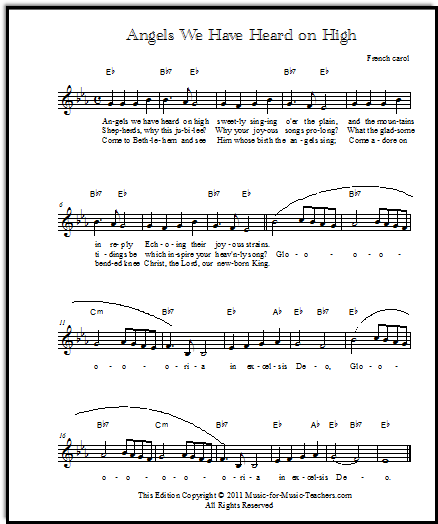 Perhaps the most beloved of Christmas songs, this is the famous German carol "Stille Nacht." A little-known French carol in a minor key. 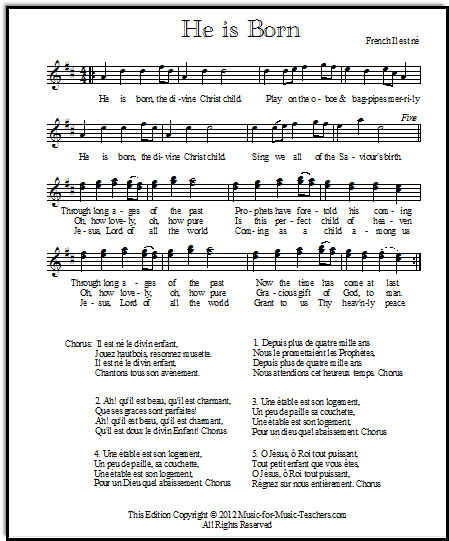 - from Scotland; a song about the escape after a devastating battle by Bonnie Prince Charlie. Very pretty and very singable. This is an amazingly lovely "lullaby wish" from the group "Secret Garden." It is copyrighted, so not avaiable here. Find out where to get this piece - your students will thank you! 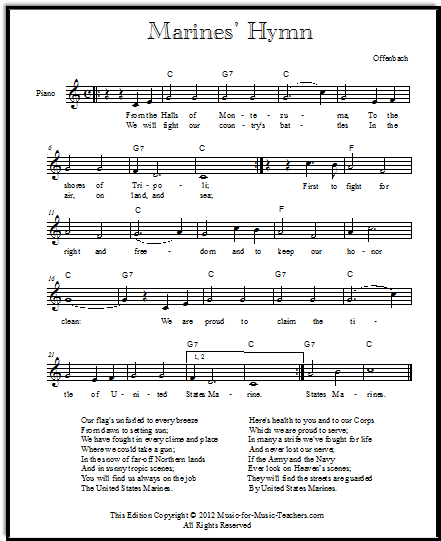 This is another lullaby, but this one is American, by Stephen Foster. Very sweet, with potential to be a nice first recital song for a young girl. With lead sheets and also guitar tabs. "Softly and tenderly, Jesus is calling... calling for you and for me. Come home..." - a moving hymn, quite old-fashioned. A favorite of my guitar-playing boys, who will even sing the swash-buckling sailors' lyrics! A different song entirely from "Spanish LADIES", this one describes the winsome ways of a pretty lady from Spain. From Ireland. 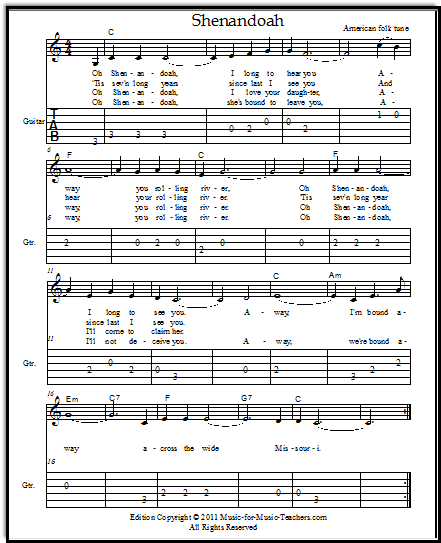 Several different arrangements, for singers, guitarists, and piano. This may be THE FAVORITE MUSIC in my studio! A very fun song from Ireland, arranged in multiple keys for piano, violin, and guitar. The national anthem of the United States of America. Arrangements for guitar and piano. I loved this cowboy song as a child. This great old song tells a story and uses fun nonsense syllables! And piano music... and lead sheets for any instrument. This song is eminently suited to violin! There is a tricky bowing pattern discussed on this page that makes this melody flow better. 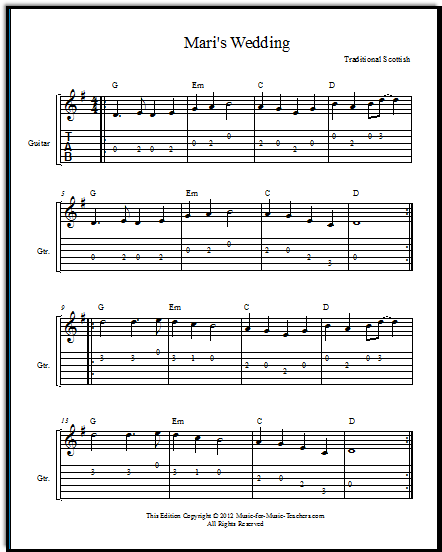 This page features arrangements for guitar and violin, as well as duet. This is a song for a male singer. An opera aria, it is slow and SO BEAUTIFUL, with a cadenza at the end. 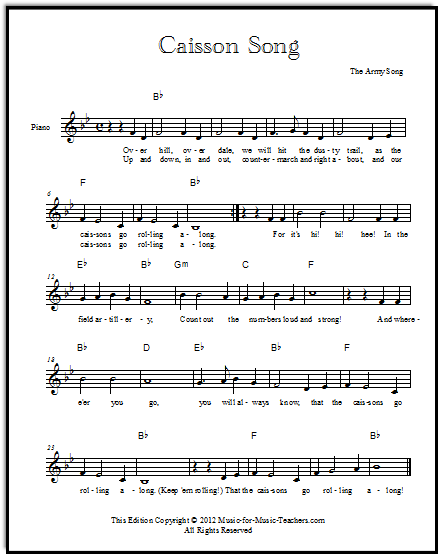 Check out the page to learn what the seemingly-sad melody is truly about. 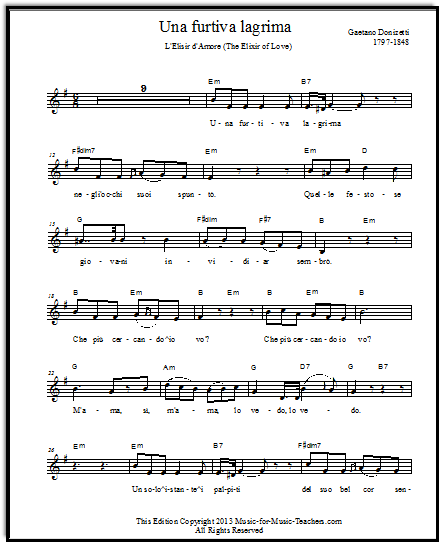 Though the vocal line is offered in several keys with chords - a lead sheet version - the standard arrangement with piano accompaniment is also available on this page. This is a favorite old Christmas song with a bouncy feeling. This is a beautiful minor song with a complex-sounding melody that builds with soaring intervals. Much repetition makes learning the melody line easier than you'd think. 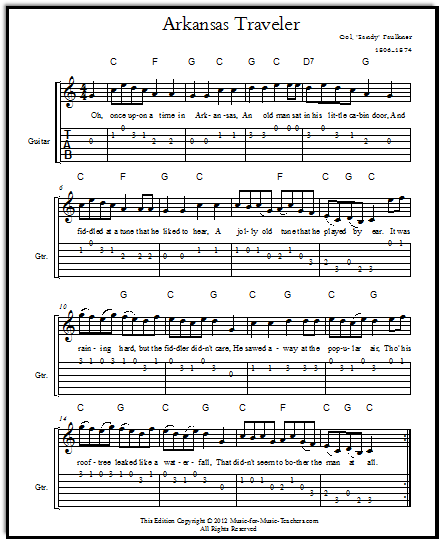 Arrangements for guitar and piano, and lead sheets in many keys. Such a lovely song, from Australia. A very pretty old song with vague but poetic lyrics about love gone cold. This page has several versions of a Middle C arrangement, for beginner piano. 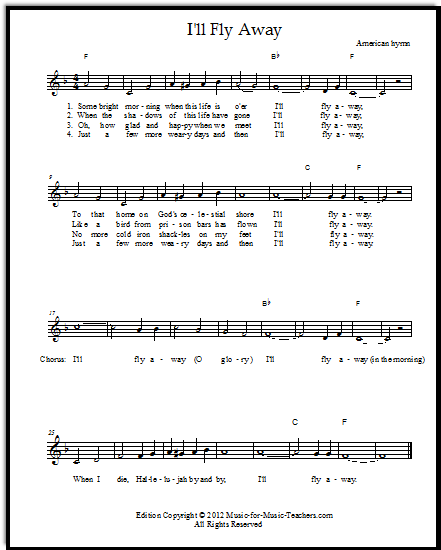 Several arrangements plus lead sheets of this energetic Christmas carol. The name of this melody is "Greensleeves", named for a woman named Lady Greensleeves. But the Christmas lyrics about the new-born baby Jesus are the words most people are familiar with. 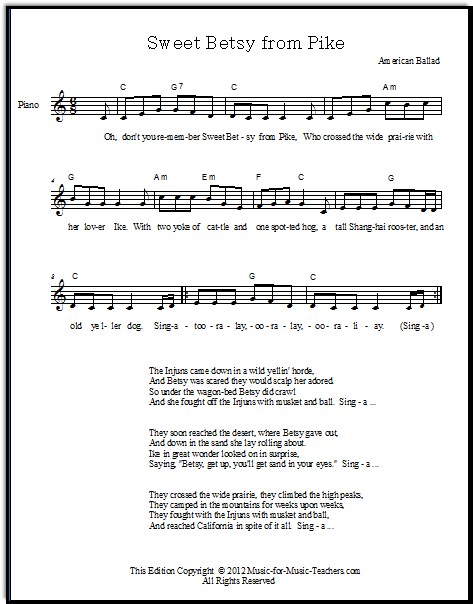 There is also a 3-page DUET on this page for guitars or fiddles - very fun! This is the well-known evocative and older hymn speaking about the love of God, so great that He sent his only Son to rescue us. This is a sweet and musically satisfying hymn, describing in an oblique way how God treasures children. Download a jazzy but easy piano arrangement as well as lead sheets in several keys! This arrangement is handy for piano, because the melody uses just the five fingers with no shifting necessary! A song about the courage of a young girl and her love for her country. She carries a banner with the forbidden colors of Ireland, and a young English soldier wants to take it away from her! Best of all, this song is lovely and singable. Will students' parents really buy the sheet music for them? Yes! This process has worked very well for us; many of the students do indeed talk their parents into purchasing their own copies, and others simply memorize the main theme and figure out the rest. I have a lot of church-going families among my students, and these songs are ones that are special to them already; they are thrilled to be able to play them at home! Well... how do I USE these free lead sheets? Once piano students understand how to add the left-hand chords this way, teach them how to do inversions of the I - IV-V chords. Do you recognize the F and G7 chord inversions? Your students don't need to wait until they encounter them in their method books to begin using them and developing an understanding of the relationship of the 3 main chords. These forms of the most-used chords (the I, the IV, and the V) are not only prettier, but also ultimately EASIER than jumping back and forth, since the left hand hardly has to move. With very young beginners, I like to start with the "pinch" chord (which is actually a G7, and not just a G chord) and the "baby" or "little F" chord. What about the IV (four) chord? 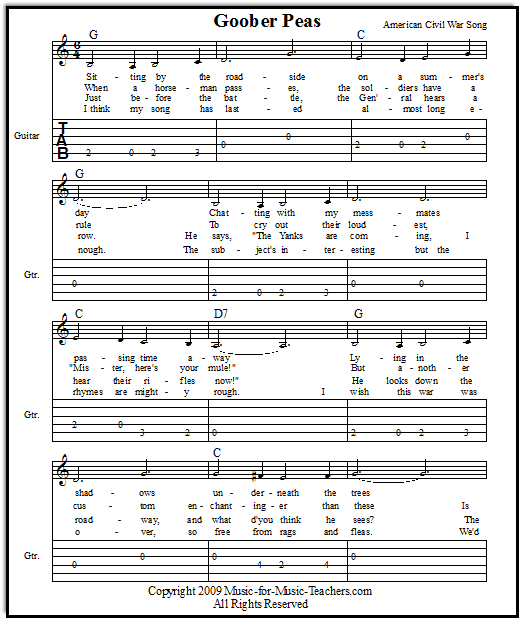 Now it is time to change songs, because Mary Had a Little Lamb only uses two chords. Let's change to "Twinkle" to demonstrate the use of the IV chord (which will be "F" if we play it in the key of C, as I usually do with beginners). These are only a few ideas, the beginnings of where you can go with these free lead sheets. See other pages, such as Mary Had a Little Lamb, for more ideas. Have fun!